How cute would these look in someone's bathroom / kitchen / office? I want some! I won't tell if you keep them all for yourself. Who doesn't need SO MUCH HELP a little organization in their life? These cute jars are the perfect organizers for the small little things in your life: buttons, craft supplies, q-tips, Polly Pocket accessories. 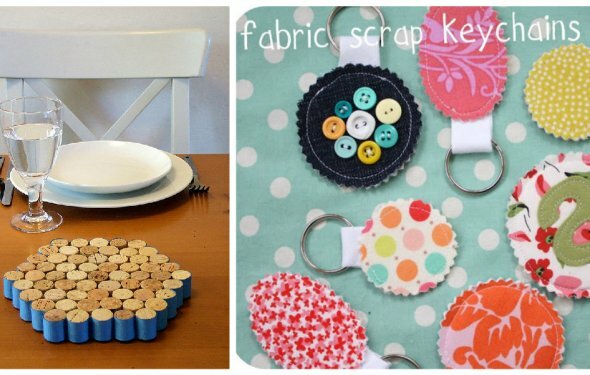 The best part about these is that you're recycling kitchen jars to make them! Waste not, want not. Style points for the pretty bow on top. If you really want to go all out at the Christmas gift exchange with your girlfriends, I think you'll win the whole party if you make this DIY sequin monogram sweater whipped up by the Girls with Glasses. In fact, I think it would be super smart of you to whip up an extra one for yourself. You and your friends can be twinsies when you go for brunch on weekends. I have visions of making this DIY fringe necklace from Brit + Co all for myself. In fact, I have the outfit put together in my head: ripped boyfriend jeans, cognac leather high heeled booties, white tee, and this stunning fringe necklace. Imagine the look on your girlfriend's face when you hand this puppy over. Make some DIY embroidery thread wrapped earrings while you watch a holiday movie. I love these so much! A touch of homemade with miles of style. Buy some basic gold hoops at a discount store like Nordstrom Rack or T.J. Maxx and wrap them in cool designs. A perfect mix of homemade + 5th Avenue style.